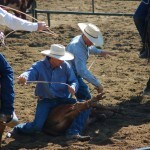 Ranch Rodeos simulate activities ranchers execute daily taking care of their herds. No rough stock is involved in a ranch rodeo, rather teams of 4 cowboys/cowgirls (of all ages) work together in in events that will include: Trailer Loading, Wild Cow Milking, Facsimilie Branding and Mugging. The Ranch Rodeo at the Tennessee Horse Expo will be the final in a series of Ranch Rodeos hosted by Taproot Farms throughout the year. Root for your favorite team and see who wins the “Trophy Jacket Series after the competition wraps up Saturday, October 17th.